There's no stronger magnetic pull than from one naughty boy to another, with their impulsive dives into the black hole of misbehavior. Witness the enduring appeal of Where the Wild Things Are as just one smirking example. I suppose Lord of the Flies is another, but let's not go there. My son's entered the phase where all things mischevious have an immediate, transfixing appeal, and insists this book is "sooooo funny!" Which means I'm doing endless back-to-back readings of it. 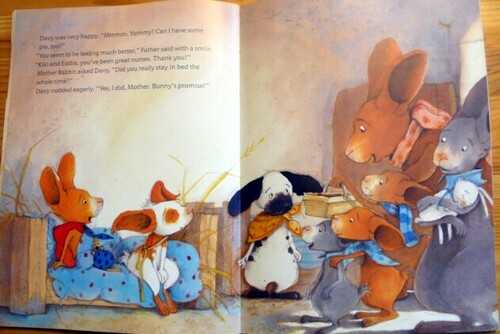 Basically, Davy's got a tummy ache, and two friends offer to "nurse" him while the rest of the bunny family goes off to granma's. 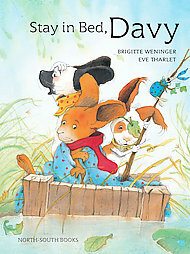 Mother Rabbit gives strict instructions that Davy's to stay in bed. But silly Mommy neglects to mention whether the bed has to stay in the rabbit warren or even on dry land. Misadventures ensue. 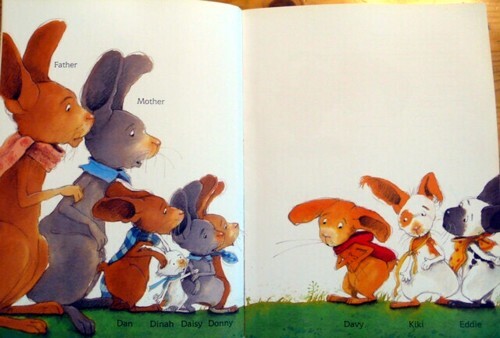 A caveat: the bunnies can be hard to keep straight. There's a lot of them and they are as alike as, well, a bunch of rabbits. 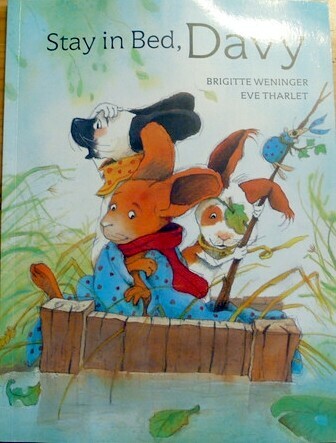 Otherwise, the watercolor and pencil illustrations in warm, forest tones strike just the right note of mayhem. I chafed a bit at the exhuberant text (translated from German), which makes too-liberal use of exclamation points. Though judging from my son's excitement, maybe not.